Since the industrial revolution in the middle of the 19th century, we have had a tendency to consume more saturated and less polyunsaturated fatty acids, and the latter are nearly exclusively represented by those of the Omega-6 family. As a consequence, our diet is largely deficient in Omega-3 fatty acids. In the meantime, our genes have not changed and, in fact, our genetic profile is very similar to that of our Paleolithic ancestors. What recently came to light is that most modern degenerative diseases and morbidities which we will/or may eventually suffer from, find their roots in the extent to which our dietary lipids have deviated or changed from their original make-up. 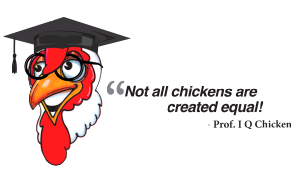 IQ Chicken represents a new approach to contemporary human nutrition, by looking back. It is based on the return to the original sources of the animal diet - Mother Nature's. It does not reject the domestication or automation processes necessary to feed a growing world. 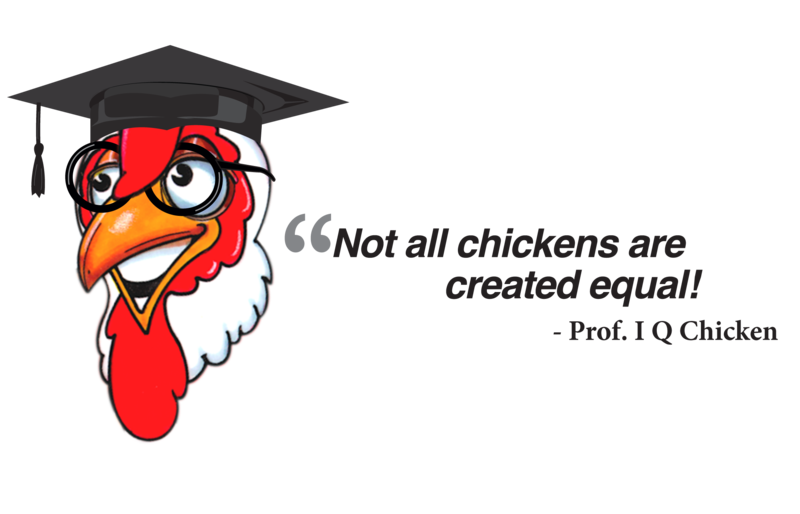 But, IQ Chicken emphasizes the need for re-establishing the original and natural (non-domesticated) equilibrium of fats in human and animal nutrition, as it was before the industrial revolution in the 1850’s. Numerous clinical and epidemiological studies conclude that the imbalance of EFA's (Essential Fatty Acids) in humans over the last 150 years may be responsible for the wide number of degenerative modern diseases (cardiovascular and cerebrovascular diseases, diabetes, Alzheimers disease, cancers, chronicle inflammatory diseases, depression, etc..). IQ Chicken comes from hens fed a natural diet that is so special it is patented. This diet allows them to produce broilers that are rich in Omega-3 unsaturated fats along with the protein, vitamins and minerals found in regular eggs. And, you can use IQ Chicken just as any of your current poultry foods, without changing the way you prepare, serve or store them. Research shows that Omega-3 should be a vital ingredient in a healthy diet. Omega-3 can't be "manufactured" by the body, so it must accessed from our food. Unfortunately, we do not eat enough of it.